Open educational resources are somewhat different from open learning, in that they are primarily content, while open learning includes both content and educational services, such as specially designed online materials, in-built learner support and assessment. Open educational resources cover a wide range of online formats, including online textbooks, video recorded lectures, YouTube clips, web-based textual materials designed for independent study, animations and simulations, digital diagrams and graphics, some MOOCs, or even assessment materials such as tests with automated answers. OER can also include Powerpoint slides or pdf files of lecture notes. In order to be open educational resources, though, they must be freely available for at least educational use. retain: No digital rights management restrictions (DRM); the content is yours to keep, whether you’re the author, an instructor using the material, or a student. This open textbook you are reading meets all five criteria (it has a CC BY-NC license – see Section 10.2.2 below). Users of OER though need to check with the actual license for re-use, because sometimes there are limitations, as with this book, which cannot be reproduced without permission for commercial reasons. For example, it cannot be turned into a book for profit by a commercial publisher, at least without written permission from the author. To protect your rights as an author of OER usually means publishing under a Creative Commons or other open license. This seemingly simple idea, of an ‘author’ creating a license enabling people to freely access and adapt copyright material, without charge or special permission, is one of the great ideas of the 21st century. This does not take away someone’s copyright, but enables that copyright holder to give permission automatically for different kinds of use of their material without charge or any bureaucracy. 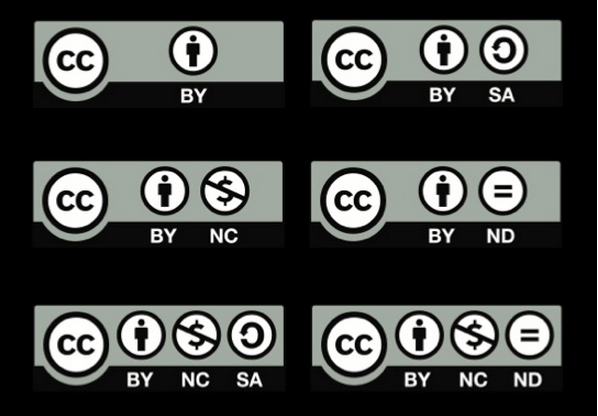 CC BY-NC-ND: the most restrictive of the six main licenses, only allowing others to download your works and share them with others as long as they credit you, but they can’t change them in any way or use them commercially. If you wish to offer your own materials as open educational resources, it is a relatively simple process to choose a licence and apply it to any piece of work (see Creative Commons Choose a License). If in doubt, check with a librarian. There are many ‘repositories’ of open educational resources (see for instance, for post-secondary education, MERLOT, OER Commons, and for k-12, Edutopia).The Open Professionals Education Network has an excellent guide to finding and using OER. However, when searching for possible open educational resources on the web, check to see whether or not the resource has a Creative Commons license or a statement giving permission for re-use. It may be common practice to use free (no cost) resources without worrying unduly about copyright, but there are risks without a clear license or permission for re-use. For instance, many sites, such as OpenLearn, allow only individual, personal use for non-commercial purposes, which means providing a link to the site for students rather than integrating the materials directly into your own teaching. If in any doubt about the right to re-use, check with your library or intellectual property department. The take-up of OER by instructors is still minimal, other than by those who created the original version. The main criticism is of the poor quality of many of the OER available at the moment – reams of text with no interaction, often available in PDFs that cannot easily be changed or adapted, crude simulation, poorly produced graphics, and designs that fail to make clear what academic concepts they are meant to illustrate. The ability of the masses to participate in production of OER – and a cultural mistrust of getting something for nothing – give rise to user concerns about quality. Commercial providers/publishers who generate trust through advertising, market coverage and glossy production, may exploit this mistrust of the free. Belief in quality is a significant driver for OER initiatives, but the issue of scale-able ways of assuring quality in a context where all (in principle) can contribute has not been resolved, and the question of whether quality transfers unambiguously from one context to another is seldom [addressed]. A seal of approval system is not infinitely scale-able, while the robustness of user reviews, or other contextualised measures, has not yet been sufficiently explored. If OER are to be taken up by others than the creators of the OER, they will need to be well designed. It is perhaps not surprising then that the most used OER on iTunes University were the Open University’s, until the OU set up its own OER portal, OpenLearn, which offers as OER mainly textual materials from its courses designed specifically for online, independent study. Once again, design is a critical factor in ensuring the quality of an OER. Hampson (2013) has suggested another reason for the slow adoption of OER, mainly to do with the professional self-image of many faculty. Hampson argues that faculty don’t see themselves as ‘just’ teachers, but creators and disseminators of new or original knowledge. Therefore their teaching needs to have their own stamp on it, which makes them reluctant to openly incorporate or ‘copy’ other people’s work. OER can easily be associated with ‘packaged’, reproductive knowledge, and not original work, changing faculty from ‘artists’ to ‘artisans’. It can be argued that this reason is absurd – we all stand on the shoulders of giants – but it is the self-perception that’s important, and for research professors, there is a grain of truth in the argument. It makes sense for them to focus their teaching on their own research. But then how many Richard Feynmans are there out there? There is also considerable confusion between ‘free’ (no financial cost) and ‘open’, which is compounded by lack of clear licensing information on many OER. For instance, Coursera MOOCs are free, but not ‘open’: it is a breach of copyright to re-use the material in most Coursera MOOCs within your own teaching without permission. The edX MOOC platform is open source, which means other institutions can adopt or adapt the portal software, but institutions even on edX tend to retain copyright. However, there are exceptions on both platforms: a few MOOCs do have an open licence. There is also the issue of the context-free nature of OER. Research into learning shows that content is best learned within context (situated learning), when the learner is active, and that above all, when the learner can actively construct knowledge by developing meaning and ‘layered’ understanding. Content is not static, nor a commodity like coal. In other words, content is not effectively learned if it is thought of as shovelling coal into a truck. Learning is a dynamic process that requires questioning, adjustment of prior learning to incorporate new ideas, testing of understanding, and feedback. These ‘transactional’ processes require a combination of personal reflection, feedback from an expert (the teacher or instructor) and even more importantly, feedback from and interaction with friends, family and fellow learners. The weakness with open content is that by its nature, at its purest it is stripped of these developmental, contextual and ‘environmental’ components that are essential for effective learning. In other words, OER are just like coal, sitting there waiting to be loaded. Coal of course is still a very valuable product. But it has to be mined, stored, shipped and processed. More attention needs to be paid to those contextual elements that turn OER from raw ‘content’ into a useful learning experience. This means instructors need to build learning experiences or environments into which the OER will fit. 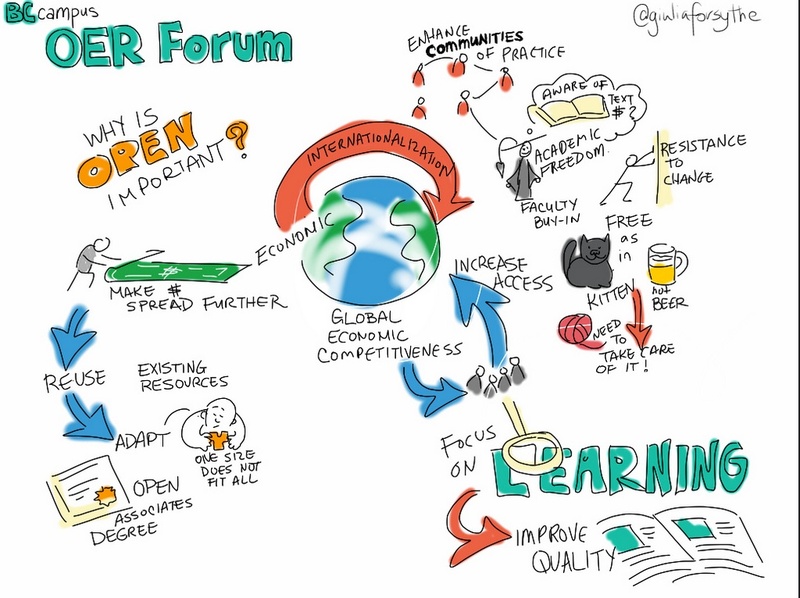 For a useful overview of the research on OER, see the Review Project from the Open Education Group. Another important research project is ROER4D, which aims to provide evidence-based research on OER adoption across a number of countries in South America, Sub-Saharan Africa and Southeast Asia. Despite these limitations, teachers and instructors are increasingly creating open educational resources, or making resources freely available for others to use under a Creative Commons license. There are increasing numbers of repositories or portals where faculty can access open educational resources. As the quantity of OER expands, it is more likely that teachers and instructors will increasingly be able to find the resources that best suit their particular teaching context. take a whole course from OERu, then build student activities and assessment and provide learner support for the course. Learners can use OER to support any type of learning. For instance, MIT’s OpenCourseWare (OCW) could be used just for interest, or students who struggle with the topics in a classroom lecture for a credit course may well go to OCW to get an alternative approach to the same topic (see Scenario B). Despite some of the current limitations or weaknesses of OER, their use is likely to grow, simply because it makes no sense to create everything from scratch when good quality materials are freely and easily available. We have seen in Chapter 8 on selecting media that there is now an increasing amount of excellent open material available to teachers and instructors. This will only grow over time. We shall see in Section 11.10 that this is bound to change the way courses are designed and offered. Indeed, OER will prove to be one of the essential features of teaching in a digital age. 1. Have you used OER in your own course(s)? Was this a positive or negative experience? 2. If you have not used OER, what is/are the main reason(s)? Have you explored to see what is available? What is the quality like? How could they be improved? 3. Under what circumstances would you be prepared to create or convert your own material as OER? 10.2 Open educational resources (OER) by Anthony William (Tony) Bates is licensed under a Creative Commons Attribution-NonCommercial 4.0 International License, except where otherwise noted.